Online Classroom: Australian History Series – Year 1 is a resourceful package! It includes an interactive online resource and an A4 book which is available in hard copy or ebook format. Book Sample: View sample of book. The online resource can be viewed on smart/whiteboards, tablets and laptops. This interactive resource includes videos, audio, clickable buttons, graphics and more. It is specifically targeted at engaging Year 1 students and bringing History to life for them. Photocopiable BLM activity sheets which link to the online content are included in this package. 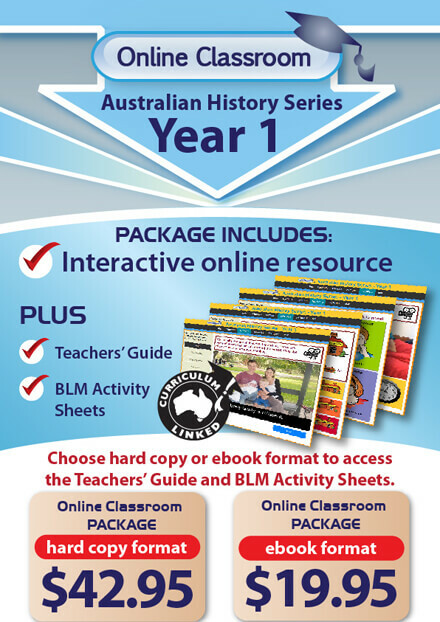 Originally created for our popular BLM ‘Australian History Series Book 1: Family Life’, these activity pages have been modified for this package. Students can complete the activities after viewing the online content. All of the activity sheets have been carefully created to meet the requirements of the Australian Curriculum. The first section encourages the students to explore family structures and roles in the recent past and in the present, and examine how they have changed and/or stayed the same. This section also gives students the opportunity to look at family structures in Aboriginal and Torres Strait Islander societies. The second section is designed to help students express time. It introduces and consolidates vocabulary to do with the past, the present and the future by exploring significant events and dates within students’ own context. The third and final section includes activities which help the students use a number of sources to investigate the lives of their parents and grandparents when they were young.